The more appropriate title would be "A Tale of Three Furnaces" but that's not as catchy. More on that in a bit. We recently had the opportunity to work with a great customer. He was relatively new to our company, only having had a humidifier installed by us last year. He wanted to replace his furnace(s) and wanted to have us present him some options. Some of you might be thinking that he had two complete systems, something not that uncommon in larger homes, perhaps one for the main floor and another for the second floor. You would be incorrect - what he actually had was two residential furnaces twinned together - something not too uncommon in a commercial setting, but slightly unusual in a residential application. What we had here was a Frankenstein HVAC system. The idea behind twinning is to take two furnaces, put them next to each other, and have them operate as a single unit. The reasons are various, but it is typically to satisfy the need for a capacity larger than a single unit can achieve - either heating capacity or airflow required for air conditioning. This can work fine in a commercial application where you may have a large area (meeting room, lobby, etc) that needs a lot of heating or cooling that a twinned setup can provide. Homes rarley, if ever, fit that profile. A home is typically multiple smaller rooms and levels with varied uses and differing loads at any given time. I suppose something like a wide open loft space with a huge wall of single pane windows might need something like that, but let's agree that's the exception here. Back to the situation at hand. These two furnaces, side by side, were below what was certainly the original air conditioning evaporator coil from the house - It was 31 inches wide and 27 inches deep. Parked below that were two 21 inch furnaces side by side. The 4 inches of vertical space between the two is where the 11 inches of width were made up in what can only be described as an abrupt transition. The rightmost furnace was essentially blowing into a solid piece of duct, being forced to take a hard left into the shared plenum before passing through the coil. Unsurprisingly, the system required numerous repairs in the previous years. At least it was the smaller furnace. Yep, that's right, the twinned furnaces weren't even the same size. One was 100,000 Btu/hr, the other was 80,000 Btu/hr input. At 90% efficient, they were putting out around 160,000 Btu of mismatched, oversized, imbalanced hot air into the ductwork per hour. Well, at least with that much output, the house was never cold, right? Not so much. You see, the home had two stories and a finished basement, one HVAC system and exactly one thermostat. This is not uncommon by any means and is probably what 95% of the homes we live in have. For the most part, it works, and in a properly designed comfort system, even multiple levels can be reasonably comfortable with a single thermostat. This system was far from proper: oversized equipment, questionable duct sizing and layout, and multiple levels added up to a cold basement, livable main floor and uncomfortable upstairs. So, what could we do to help out this customer? The first thing we did was a full Heat Load calculation. By taking the measurements of the home, understanding the orientation on the lot, determining the insulation values of the walls, ceilings, and windows, and plugging that into the ACCA Manual J spreadsheet we determined that the heat loss at design conditions was literally half of the current furnace capacity. That might not sound too bad at first (well, actually it still sounds bad) until you realize that the Heat loss value is a Worst case number. I usually tell people it's how much heat you need at 4AM in early February. In other words, it's the most heat you're ever likely to need. That means that for the rest of the year, when it's not -10 outside, you need less - sometimes much less - heat supplied by your furnace to keep the house comfortable. Unfortunately for our homeowner, his system only had one speed: Insane Blast Furnace. That means that on a mild fall day where you only need a little heat, the system was coming on, melting the curtains (not literally) and shutting off in short order. That is not only very hard on the equipment, but it also causes some pretty serious comfort issues. The system simply doesn't run long enough to exchange the air in all the rooms to get them warm and comfortable. 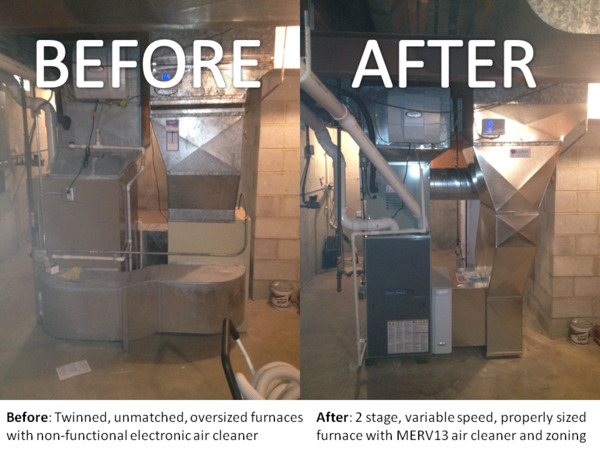 Our solution was to install a properly sized furnace that has two stages of heat. It still has the capacity it needs for those coldest days, but the majority of the time, it can run at a lower output to increase the length of time it takes to heat the house and gets you as close as possible to a nice even temperature throughout the house, despite varying loads and poor ductwork design. The other issue that we fought was control of the system. Because the thermostat is on the main level, as soon as that room gets to the temperature it needs, the system shuts off, even if the second floor is still cold. The second floor will also get cold much quicker than the main floor because it has all the surface area of the cold attic above as well as the walls and windows heat is transferring through all around. The short run times caused by the oversized equipment just exacerbated the problem even more along with ductwork that wasn't carrying a large enough percentage of the heated air to the upper level. Our solution was to install a zoning system with an appropriately sized bypass to allow for seperate control to the upstairs, main living area, and master bedroom. The system has three seperate thermostats along with mechanical dampers in the ductwork to open or close the airway to the three zones as needed. That not only allows the system to get all three areas comfortable (after all, now it can tell what the tempatures is in each) but also allows the homeowner to turn the temperature down in the areas that aren't in use. For example, you don't need to keep the living room warm when you're sleeping in your bedroom at night - this system would allow you to keep them at different temperatures so you can be comfortable and save energy at the same time. These all seem like simple solutions, but the reality is that multiple other individuals had contributed to the larger problem throughout the years - both contractors installing the systems and homeowners buying them - each bringing the system a little closer to the breaking point, each making the home a little less comfortable to live in and each using more energy and dollars in the process. A 40 year old coil connected to a 15 year old air conditioner on top of two 20 year old furnaces - A Frankenbeast if there ever was one. Thankfully, the customer allowed us to educate him and trusted us when we said that a single 100,000 Btu/hr furnace would not in fact leave him in the cold and would make things much more comfortable, be much more reliable, and use much less energy. So, the moral of the story is that when you find yourself in need of replacement HVAC equipment, have the entire system thoroughly evaluated. You may have inherited a Frankenbeast without even realizing it. Note: the only thing that I wish we would have been able to do a little different is the return transition into the air cleaner. It's hard to see from the angle of the picture, but we had to move the return front to back almost a foot and a half to line up with the new furnace and the fittings simply didn't lend themselves to using a nicely radiused boot. The system still peforms approximately 1 million percent better than the one it replaced. Approximately.